While American artist Stephen Scott Young produces paintings, copperplate etchings, and prints, he is best known for his watercolor works, which exhibit a commitment to the tradition of American realism – unique in an art sphere that is more and more preoccupied with abstraction and modernization. Inspired by his 1984 trip to Harbour Island visiting his Bahamian wife’s family, he has been absorbed with creating depictions of everyday life in the Bahamas ever since. His pieces offer a refreshingly simple, sweet sense of nostalgia that creates an emotional resonance with viewers, reviving an artistic style that was in danger of becoming outdated. This particular piece is titled On Whale Point (Zaria). Although the title names a location in Eleuthera, Young’s Bahamian island of choice, the girl’s surroundings are composed of abstract splashes of brown paint, leaving her the sole focus of the viewer’s attention. 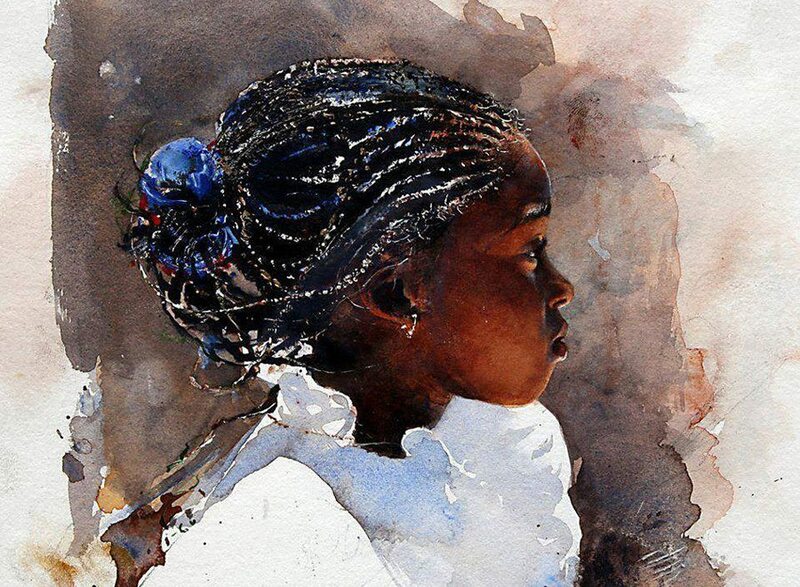 In contrast to the deliberately unfinished background, the girl’s features are painted with painstaking clarity: from the individual knots in her braided hair to the gentle contours of her face, each detail is carefully considered and precisely captured. The high contrast between the highlights and shadows of the painting, combined with the airy white folds of her dress and the bright glow of light illuminating her face, evokes a warm summer afternoon on the beaches of Eleuthera. The girl’s expression, however, is listless, her eyebrows upturned and her lips painted in a soft, almost imperceptible pout. What is she gazing out at? What in this slow, peaceful island life could have caused her slight frown? Young’s attention to detail and devotion to realism has allowed him to capture the subtlety of human expression, conveying the girl’s enigmatic dissatisfaction and making her come to life as a multi-dimensional person rather than merely rendering her a part of some postcard-perfect landscape. The warm tone of the painting and the traditional style in which it is painted makes it relatable to the viewer, allowing it to retain its sense of comfort and tranquility even with the question of the girl’s pensive face. In this way, Young’s work combines the complexity of real life with the picturesque peace of tropical paradise. What do you think this girl is thinking about? Interesting piece of art reflecting complex human inner feelings towards the world outside. The attention to detail on the subject’s expressions is fabulous!